The long-blighted community of Riverside, just across the Peconic River from downtown Riverhead, has never been a particularly welcoming place, but in recent years, many of the few struggling businesses there have been shuttered, leaving the community with little incentive for change. Riverside, which is in Southampton Town, could have some help in upcoming months, after the town agreed last week to enter into an agreement with the private Plainview real estate development firm Renaissance Downtowns to come up with a plan of action to lift Riverside’s blight. Three of the principals of Renaissance Downtowns explained their plans to the Southampton Town Board at a work session Dec. 5. “We’re both excited and proud to be part of what we feel will be a wonderful experience for all of us,” said Renaissance Downtowns’ CEO Don Monti. Renaissance Downtowns plans to start their work by opening up an information office in Riverside, where they will meet with store owners and residents who have ideas for how to restore the business community there. They will also be using a concept known as “crowdsource placemaking,” a social media platform where people who have a stake in Riverside’s future can share ideas. The firm’s Vice President of Planning and Development, Sean McLean, lives in Flanders, and he said he has a real stake in the success of the project, which will also include some of the Flanders Road corridor east of Riverside. 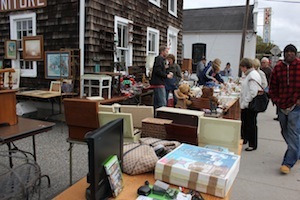 A tag sale in October outside the Riverside furniture store. In their other half-dozen projects in places like Huntington Station, Hempstead and Bristol, Conn., Renaissance Downtowns works, at their own expense, to build relationships with business owners and help them develop ideas for what they want to see built there, before building their own projects in the midst of the community that’s already there, said Mr. McLean and Mr. Monti. Town Supervisor Anna Throne-Holst asked if the plans would include determining whether the neighborhood wanted a Trader Joe’s supermarket or a library or an age-restricted community. The developers said it would be far more likely that they would try to find a local grocer, say, who was interested in selling fresh produce, or someone who wants to open a bookstore whom they could help expand their business plan by adding a coffee shop or performing arts space. He said four property owners have already contacted him since the town’s partnership was announced two weeks ago. “We don’t make any profit off of this part, but it causes economic development,” said Mr. McLean. “Ultimately, when things get built, that’s when we make our money,” said Mr. Monti, who added that Renaissance Downtowns, in conjunction with business owners in the community, will lobby state, federal and county government for money to get the project done. Until that plan is in place, he said, his firm will do all the work at their own expense. 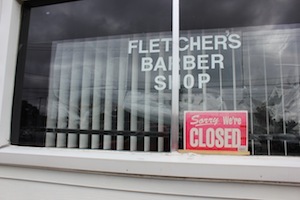 Fletchers Barber Shop is closed Saturdays. Ms. Throne-Holst and other board members asked several pointed questions about why the firm was willing to take on so much risk. Mr. McLean said crime also has to be addressed in the early stages of the project. I appreciate the collaborative thread of this proposal. If you’ve heard the song”Deep Ellum Blues” riverside could make a similar turnaround. “If you go down to Deep Ellum put your money in your shoes…” I was there in the late 80’s and something cool was going on there to turn this dying and dangerous Texas town around. Not the big-box approach rather a bottoms-up let’s work together approach. What do you have to loose?